Weihenstephan: meet a German gardener or landscape designer, and the chances are, they studied here. Its a unique institution, with no real equivalent in the English-speaking world, a whole campus, which sprawls attractively across a couple of hills and the intervening valley, and unlike most such places it is not the buildings that make the impact but the gardens, research plots and fields of crops. The 'Sichtungsgarten' (Show Garden) occupies one of the hilltops, the famous brewery another, while very nearby is another hilltop, the Domberg of the little town of Freising, with its 'Dom' (cathedral), one of the most fabulous of all the fabulous Baroque churches of southern Germany. To read more go to the Gardens Illustrated website... and its in the magazine this month too. Stachys macrantha at the centre. A solid clump-forming perennial it is in the company of a blue Geranium pratense behind a white Chaerophyllum temulum, a wildflower which has introduced itself. 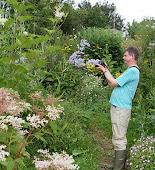 Summer, especially a wet one like the one we are currently having a fuels some prodigious herbaceous growth. Visitors are often astonished at how lush everything is and ask what I feed with. The soil is naturally fertile however and holds moisture. Weed growth is prodigious too, indeed I have written before of my never-ending battles with weed growth - at times I wonder whether it is time to move on and garden somewhere where I don't have to spend so much time battling such determined opposition. In the past I have let perennials just grow but I am increasingly interested in more active management. Here I would like to look over some of the ways I have been using and managing perennials during this very active period of summer growth. Campanula lactiflora flopping badly, as this weak-stemmed two metre perennial usually does, but the upper half has grown into a hedge which is supporting it - a clue for good placing if you do not want to stake. I stake virtually nothing, and indeed not staking is almost a 'new perennial ' shibboleth. The modern range of perennials tends not to need staking, but there are exceptions as some species just seem to weak stemmed by nature such as Campanula lactiflora. In rain many do hang their heads and since I rather like narrow paths that creates obvious problems especially when we have groups coming round. This year I have done a lot more 'Chelsea chopping' to manage things like the campanula. I am also doing some lighter and more frequent trimming back of herbaceous growth particularly along paths. I got this idea off the wonderful Jardin de Berchigranges whose ultra neat lawns are edged by neatly shaped border edges before the plants are allowed their head further in. Their borders, like ours, are very dense, with almost solid perennial growth. I use a light battery-powered hand-held strimmer to do this, and in many stretches of border which in the past drenched the legs of passers-by are now nicely graded. Most perennials, only excepting monocots like grasses, lilies and agapanthus, send out new shoots if cut back and bush out. Two examples of trimming perennials along the edges of paths to keep them clear and the mini-strimmer. Astrantia again but in a more natural situation being partly supported by stronger aconitums and interwoven with geraniums which have finished flowering. Planting here is very dense, and indeed it seems to be a general trend that planting over the years planting is getting denser in many gardens, although nothing like as dense as nature. In the past plants were grown more separately. It was widely believed once upon a time that planting had to show a plant's shape. 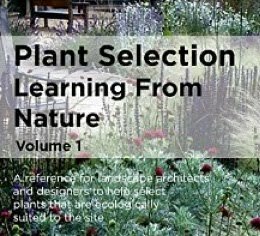 But many perennials do not have a distinct shape as such, as they are growing so much cheek by jowl with other plants that they occupy whatever space they can. Geraniums and astrantias are two examples of plants with a very plastic method of growth, stems winding their way through other plants, being supported by them and sometimes penetrating right through them to emerge at the top; leaf stems for example can be very long and sinuous. Here is Geranium endressii beginning to climb into a bamboo. Such fluid growth makes these very adaptable plants. Perennials with upright stems are less likely to do this and in many cases can be seen as literally the pillars of the border. Geranium endressii at it again, clambering up Helianthus (left) and Solidago (right) stems. Much of our border planting is a dense mass which includes many different perennial growth habits, and this is the secret: enough uprights to hold it all together visually and structurally and then others with the highly flexible habits of the geraniums. MyGardenSchool offers certified gardening and garden design courses, all taught by best-selling authors. 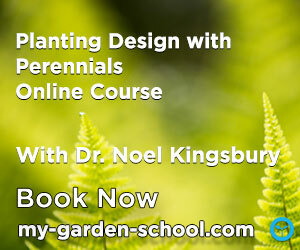 Courses include my course on Planting Design with Perennials, as well as many more. Others courses include Professional Planting Design, Planting Design with Grasses, Self-sufficient Vegetable Gardening and many more. You learn online so you can study whenever and wherever you want, alongside students from over 50 countries world-wide. Each course has optional assignments so you can practice as you learn and get personal feedback. Simply using tall plants on their own is liable to create a very solid prairie effect in which most are simply invisible. I have done this in part of the garden and I must admit I have not got it right. However, such plants can be used to create a seasonal screen, a perennial hedge. This can be less than one metre wide. Species are needed that don't have untidy or bare lower stems, although a few can be slipped in. Grass Calamagrostis 'Karl Foerster' is a good basis for such a planting. Calamagrostis 'Karl Foerster' with Veronicastrum sibiricum and Lychnis chalcedonica make up a perennial screen or hedge. Primula florindae, in our damp soil thrives and seeds and makes a great edging between border and path. Short plants are useful for creating space and for edging. This is quite a traditional use and can look a bit contrived and controlling if overdone or done too neatly. Integrating smaller or ground-hugging plants into these lush perennial combinations is difficult, rather obviously as they are liable to get swamped by everything else. Ground covers are useful though where there are plants you need to give space too, perhaps like roses or other shrubs and don't want tall things. Particularly useful are those species which have the flexible growth habits of geraniums but on a smaller scale. Phuopsis stylosa is one, usually grown as a ground cover, which it does well enough and is very jolly with its bright pink flowers, but it is rather untidy, neither Jo, nor our gardener Diana, like it. It is in fact an exotic version of our native bedstraws and is not naturally a ground cover plant, but climbs and scrambles through other plants. I'll end with a shot of a new planting which is an experiment in co-existence and matrix planting using 50% Carex muskingumensis; it's stiff and upright and helps form a solid mass that holds up weaker plants like the dark-leaved Lysimachia 'Firecracker' here. The light green shows off other plants well too. Hemerocallis 'Golden Chimes' with Carex muskingumensis and Lysimachia clethroides.